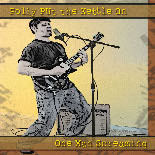 One Man Screaming, the 4th installment by Polly PUt the Kettle On released in 2008 proves that PPTKO is alive and well in the land of the free. While still a little 'different', this album will be more accessable to many listeners, combining newer ideas and effects with old reliable ones. Production quality moves up a couple notches on this album as well as a more focused vocal line.